Mint Oreos pretty much rock. First of all, they are double stuffed, which is pretty awesome. Second, the minty cream filling is a really cool green color. After my first bite, I was pretty much addicted, so thank goodness I already had a plan for these delicious minty treats. I made these for my friend who's crazy about all things mint & chocolate. Check out these cupcakes that I made for his birthday this past year. These Mint Oreo Cupcakes went over very well. Just a few notes. First, I roughly chopped up some cookies and added them to the batter so there were nice chucks of Oreos inside the cupcakes. You can't see them because I got trigger happy with my camera and forgot to take pictures of the inside of a cupcake. But believe me, they are there, and they are wonderful. Also, I went with 1/2 teaspoon of mint extract in my buttercream, which I think was perfect, but you can always add more. However, start out with 1/4 teaspoon first. Remember, you can always add more, but you can't take it away. Line muffin tins with cupcake liners and set aside. Mix cake mix according to directions on the back of the box. Roughly chop about 18-20 of the mint Oreos and set aside. Fill cupcake liners about 2/3 full and then place 3-4 of the Oreo chunks into each cupcake. Bake according to directions on the back of the box. Beat butter until fluffy. Gradually add powdered sugar and milk. Beat until combined. Add extract and combine. Add desired about of food coloring and then mix until well incorporated. Stir in the finely crushed Oreos. Frost cooled cupcakes. Garnish with mini Oreos if desired. Yum!! I love mint and chocolate together, and those death by oreo cupcakes I made a while back were one of the best cupcakes I've ever put in my mouth, so I have no doubt I'd feel the same about these! i'm pretty sure i could live on that frosting alone! speaking of which, i might need to get some frosting piping lessons from you - they look amazing! Shannon, these look DELISH! Great job!! I love mint with chocolate!!! These look scrumptious! I have been wanting to make mint oreo buttercream for so long! These look super yum! OH! 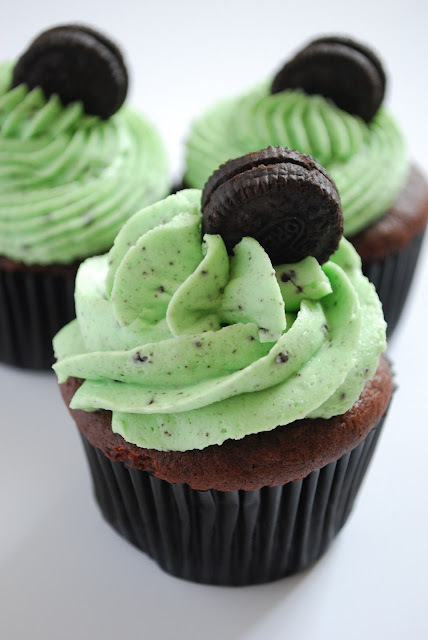 Mint and Oreos...only two of my most favorite things ever!!! I MUST try these! How do you keep the tiny cookie pieces from building up in the tip (the one used shown in the pic)? I ended up using a round tip, but I wanted to pipe them using the tip in the pic. Thanks!